Max. Lifting Weight: 1000 lbs. ☞Telescopic: 4-8x30 magnification, range: 6000 ft.
☞Macro Lens: 2x-20x magnification, range: 3 ft.
☞Targeting Display: Cross-hairs on target. +1 to strike w/ ranged weapon. Pilot: Robot and Power Armor Elite (10th Level) Power Armor (Flying): See Flying Power Armor for specific bonuses. Full Strength Punch: 1D6 M.D. Impervious to psionic bio-manipulation, telemechanics, see aura, and any attacks or weapons that do damage direct to hit points. Last edited by Carl on Thu Aug 07, 2014 4:55 pm, edited 26 times in total. 1. Independent personality with an average to high I.Q. 2. Communicate through limited telepathy. 3. Are totally indestructible, the blades never dull. 4. Made of black, dark grey, blue grey, or dark red metal and lined from tip to handle with runes. 5. Do no less than 4D6 damage (in Rifts they do 4D6 M.D.). Most known weapons do not exceed 6D6 points of damage, although a few are known to do 1D4x10 and 1D6x10 damage. In mega-damage dimensions, that damage is mega-damage. 6. Link themselves to their wielder/owner within six months of constant contact. Thus, both man and weapon can sense each other's presence within a four mile radius if separated. 7. Adds +1 to all saving throws. 8. Can be used only by a person of an evil alignment. Characters of an incompatible alignment take 2D4 points of damage each time they touch the weapon or 3D6 damage if a creature of magic. Curse: Together, Akahige & Yojimbo form a set of Greater Rune Daisho, with the abilities of a greater rune weapon split between the pair of swords. Personality: An older male eta who is generally dominated by his wife. Akahige & Yojimbo only work together though they are not quiet in their displeasure in doing so. Heal wounds: 2D6 hit points and 2D6 S.D.C. or 2D6 M.D.C. for mega-damage beings; can be performed 6 times per 24 hour period. Remove curse: 56% chance of success, once daily. Turn 4D6 dead: four hour duration, 55% chance of success, four times daily. Animate & command 2D6 dead: four hour duration, 64% chance of success, two times daily. Once summoned, the elemental will fight for the shuriken wielder for 1D6 minutes. Last edited by Carl on Sat Feb 07, 2015 7:55 am, edited 22 times in total. Carl was born in Burbs of Chi-Town. At the young age of 12, Carl was apprenticed to a Japanese karate instructor. After five years of serving and training, Carl master/instructor asked him to accompany the old man to Japan on what Carl believed was just his master visiting his homeland, In Japan, Carl was betrayed by his master and forced to be a part of a experimental project for the Japanese military. Carl was attacked and knocked out by his master; he awoken in a hospital room with eight other boys around his age. Carl was aware of his surrounding but did not have control over his body. It only took a few hours for Carl to learn what had been done to him. Although he looked like an older version of his formal self, 75% of Carl's body was replaced with cybernetics. When he looked in a mirror, it was impossible to tell that his entire skeletal frame was made of metal or that his artificial skin was not real. His cybernetic looked so real that he could pass a minor physical examination without the doctor knowing. He even have artificial blood running through artificial veins. When he was activated, it was easy to see that Carl and the other eight victims was not ordinary humans. Not only had he gain cybernetic abilities, his normal abilities and reflexes were enhanced 10 times more than normal and they continued to improve as he mind adjusted to his new body. While in training, Carl was able to piece together what had happened to him and why his master/instructor betrayed him. The Japanese government had sent agents all around the world to find and kidnap subjects that had no ties to the Japanese government and had a better than average change of surviving being converted into a cyber ninja assassin. Over many years, Carl performed covert operations and assassinations for the Japanese government. 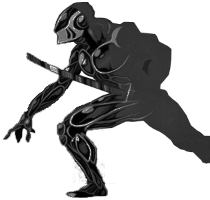 His cyber ninja abilities allowed him to infiltrate corporations or take over a person’s identity for extended periods of time to achieve his assignments. Carl opportunity to escape came during an operation that would upgrade his control chip. When the doctor inadvertently removed the control chip to replace it with the upgraded model, Carl made his move. After killing all the doctors in the room, Carl walked out of the building disguised as one of them before blowing up the building to hide his escape. He has been on-the-run ever since. He knows, if the Japanese government ever learned that he was alive, they would not rest to reclaim what they believe is their property. With no one looking for him, Carl hid in plain sight. He worked as a mercenary and assassin for hire until he could earn enough to make it back to the US. Once back in the US, the first thing Carl’s did was find the location of his old master/instruction who had returned to Chi-Town to find additional victims. Once he was found, Carl killed the old man quickly without letting the man know why he died and/or who killed him. Carl journeyed to MercTown to get some work and to get readjusted to western ways. He landed a role in a tough Merc group called the Spook Squad. Although he was unsure about joining a team that is lead by a Cyber-knight, the knight is just devious enough that his beliefs does not interfere with the way Carl does his business. Carl always carried the persona of being calm, cool and clear headed, no matter what the situation. A fight with a wraith changed his ability to keep his mind focused 100 on maintaining that persona. During one mission, Carl was confronted by a powerful wraith who tried to convince the ninja to join its team. Falling to recruit Carl verbally, the wraith decided to take a more direct route that went through Carl’s mind. The mental attack caught Carl completely by surprised and if it not for the actions of his rune swords, the creature would have taken total control of the ninja. With his sword helping him defeat the mental attack and his teammates helping with the physical attack, Carl was able to destroy the wraith. Although the creature was defeated it did not completely lose the fight. The wraith left some of its memories, talents, and persona in Carl’s mind. The calm, cool, and clear headed ninja will finds himself knowing and remembering things he should not know or remember, physically performing skills in a different was that he was taught and/or practiced, and a phobia to keep himself clear as much as possible. Although he is aware of everything except the new phobia, Carl has no idea what new information his know or what new talents he process or when the knowledge/skills will override his own. Most of the knowledge has been useful, but it could become fatal, especially when Carl stops in the middle of a fight to brush dirt off of his armor. Carl has finally admitted that the merging of the minds with the wraith has changed him. If it is a change for the better or worst is yet to be determined, but at least now he is willing to use the new found knowledge and skills to his benefit. He decision to handle it like he handles the rest of his equipment and tools, he plans to practice using them and making them work for him. Consciously Carl wants to stay away from the Japanese; unconsciously, he cannot resist building up his collection of rare Japanese (at least rare outside of Japan) items. Carl no longer cares about concealing his cyber-ninja technology; at least three cyber-docs have seen how unique his systems are. It would be fun if one of the town’s doctors used some of the techniques, the Japanese found out about it, and the team was hired to protect the doc while delivering him to a safe location. Carl’s nature would be to kill the doctor to ensure that the doc could not lead his enemies to him, but the team taking the contract would prevent that. Carl would not mind doing someone else’s background story. Last edited by Carl on Wed May 08, 2013 4:14 pm, edited 1 time in total. Skills can either be purchased via EP, or earned via XP levels; there are a few very rare exceptions to this. None of these skills are properly annotated or formatted. Use this for the basic formatting. Language: American - 98 native language (+3%).